At the law firm of Steinberg, Burtker & Grossman, our Chicago personal injury attorneys have been serving injured people throughout Illinois for four decades. We have built a reputation for ourselves by putting our experience to work in complex personal injury cases. Do you suspect that there is more to your case than meets the eye? Do you believe that your case may need to be taken to trial in order to get the results you deserve? Do you want the confidence that comes with knowing that you have an experienced lawyer handling your claim? Then we are the law firm for you. 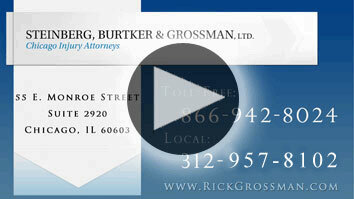 Discuss your case with our skilled, compassionate and reputable personal injury lawyers in Chicago. We thrive on complex cases, such as those that involve more than one of the issues above. Our successes include car accident cases with elements of product liability , workplace accidents involving motor vehicles and more. Our experience allows us to quickly sort through every factor and then to zero in on the key issues. Then we move forward to get results. To learn more about our successful case results, visit our Representative Cases page. Not only do we focus on complex cases, but also on cases involving the most serious injuries, such as brain injury and spinal cord injury. We also represent families who have lost loved ones due to wrongful death. Thinking ahead can be critical. Not only do we want to get you a settlement, we want to make certain the settlement is structured appropriately. We want to ensure you don't face any negative financial consequences. Our attorneys are ready to handle the most challenging issues. Do you want the confidence that comes with knowing that you have an experienced personal injury attorney or Chicago medical malpractice lawyer handling your claim? Contact us toll free at (312) 401-4445 for a free consultation.